Hey, I'm just showing you the bodice of this dress, because really, that's all you need to see, right? You should be clicking on the image right now, actually. I was trying to find some information about Suzy Perette other than "omg so cute! want!" but had no luck with an (admittedly desultory) Google. Anybody got a good link? Smokydiva's got this listed on eBay as a Buy It Now for $55, and it's a B40/W32. And check out the crazy print! If I bought this, though, I would spend the rest of my life looking for spectator pumps in black and just that shade of blue. I mean, wouldn't you? In fact, the more I sew for myself the more frustrated I become at not being able to make my own shoes. That's pretty much why I'm so excited about That's how you know you're an unreconstructed girl geek; you read Wired because you want to apply new tech to making pretty clothes. New Lucky mag today, which I love. And hate. I love Lucky because their editors find these gorgeous things and present them to you with absolutely no pretense that they are anything other than pretty inconsequential things that give pleasure (that is, they don't have the Vogue disease where everything is Culturally Important). I hate Lucky because their stylists are colorblind pranksters hellbent on playing "exquisite corpse," only with innocent clothes. I mean, look at this dress above. Nice, right? Great color, elegant lines. Pretty. Maybe I'd leave off the sash, or tie it a little higher for a more empire line, but it's not hilariously wrong. I tend to rip out pages from magazines if there's a striking image, or if there's something that belongs in my Binder(s) of Good Ideas, and the pages I tear out of Lucky hardly ever feature a living person, unless by chance what has caught my eye is the topmost stratum of all the layers of WTF? that the stylist has aggregated. Look carefully — the feathers are satin, not actual feathers. Click on the image to visit VintageTextile.com and see the details; they're astounding. The dress is nearly $1500 (!) but even at that "price point", it's already reserved. I love the color, the applique, the tulle … I'm a huge fan of this kind of dress, simple lines with over-the-top embellishment, but monochrome. I think this would make a gorgeous swan-like wedding gown (even though it's not WHITE, go on, defy the bridal paradigm! ), but I'm not sure if a swan gown's a good thing or a bad thing. I have a vague feeling that swan brides in folktales usually lead to a lot of unnecessary complications, so perhaps that's not quite what you want to start your married life by invoking. If you have a little time spend it clicking around on that site and making a list of what you'd buy if you won the lottery … I have my eye on their Ceil Chapmans, but the rest is fair game. It's $95 and 36-26-36 … click on the image to check it out. Check it out — this dress is listed for $6.99. That's right, seven dollars can get you a very nice (if a little small, and if in need of a teeny repair, the kind that even people who don't sew on buttons can make) holiday dress. I love eBay. I also love the balletic lines of this dress — the round neck, the elegant sleeves, and the belled skirt. Nothing's better than a dress that makes you feel like a ballerina, all neck and grace. Anyway, eBay is JAMMED now with people selling things that have only the most tangential relationship to Christmas. (Seriously. I don't care how emo your Christmas is, an early-80s Le Tigre lime green striped polo dress is NOT a "holiday dress.") And eBay is also jammed with people selling things that maybe, almost, could have been something that Sienna Miller almost once looked at. (Looked at and said "nah …", I hope.) Seriously, in five pages of listings I saw eight Sienna mentions. What is it with "Sienna Miller: Fashion Icon"? I just don't get it. As they like to say in my homeland, "All her taste is in her mouth." And who searches clothes on eBay with the keyword "Sienna Miller"? They're probably not as scary as the people who search clothes with the keyword "Paris Hilton," but they're still pretty scary. A lot of the vintage fashion books I have are big on developing your own style; you need to figure out what suits YOU, and then work to make it coherent. Every fashion magazine I see now is hell-bent on propping up four or five overly-styled quasi-celebrities and asking you to choose which one you would most like to emulate. ("None of the Above" never seems to be an option.) I believe the next step will be Sienna Miller *kits*, that you can buy in a department store, like those old "Multiples" sets from the 1980s. (Which she seems to be singlehandedly trying to revive, but never mind.) They will include bad pants, a ridiculous and incongruous hat, expensive and ugly shoes, and a random tunic/shirt/dress to top it all off, plus miscellaneous bling. Kind of like Ooh, I can hardly wait. I bought this one from and I think it's going to turn out to be a workhorse. It's got four pattern pieces, not including the facings — the pockets are cut in one with the skirt. It needs barely 2 1/2 yards of fabric — a smidgen, compared to what I usually sew. I can usually piece together 2 1/2 yards out of scraps! (Okay, that's a slight exaggeration, but you know what I mean.) If I can get the fit right I could probably run up three or four of these in a couple of days, and if I pick some SOLID COLORS for a change, I could probably wear them for years. I have some nice old-gold wool crepe that should make up beautifully into this, and if I wanted to get fancy, I also have some bubblegum.jpgnk satin that would be really cute. (Although that last really isn't something you can wear over and over again …) A dress like this under a nice cardigan or little jacket (of which I have, again with the exaggeration, hundreds) can go anywhere and do anything. 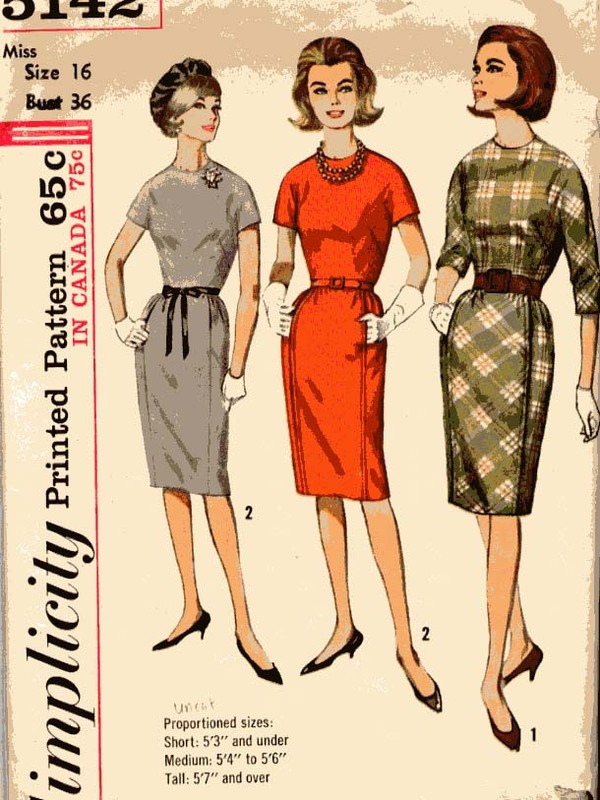 It's even supposedly one of those "proportioned" patterns, with different bodice pieces for petite, medium, and tall sizes. I might measure the petite bodice and cut that one instead, as I'm so short-waisted. I'm not sure, though, if I'll do the neck facings. I hate neck facings, they're so lumpy and bulky and need so much trimming and fussing. I might cut bias binding in the same fabric, or maybe line the whole bodice (I have ten yards of lining silk around here somewhere, might as well use it) instead. If I am careful about the zipper placement at the neck edge, I think bias binding is probably the way to go … it looks so much neater. Old gold, dove gray (I have some nice heavy Italian cotton with a bit of stretch that I tried to make a Vogue DKNY pattern out of, a great pattern I'd made half-a-dozen times before and that for some reason I can't find online and am too lazy to scan (but let me just say it has a midriff band) but the combination of the pale gray and the very severe pattern lines made me look like the warden at a women's prison), and maybe even black — I have some nice black Italian cotton, too. I always buy black fabric and think "oh, I'll make a black skirt!" and then I either never do, or I never wear them when I do. (A plain black skirt is something you can always buy for $30 at Loehmann's.) And red. I have some red sitting around just begging to be made, like a puppy wanting a walk. Guess I better get cracking.